Over the Christmas Holidays, Daniel and I are exceptionally busy as we transform our home for a new year of broadcasting for YouTube. This is the best time of year to do this for us. Both Daniel and I are tired of conforming to what others feel a home should look like. We love colour and boldness of colour. To be fair, everything staged in the photographs were items we already owned. The only difference is that we carefully selected the furniture and accessory items to be in this room after we had transformed the walls. In this article, I am going to share some tips. Though I would love to take credit for the colours, this 100% Diva Dan’s creativity. 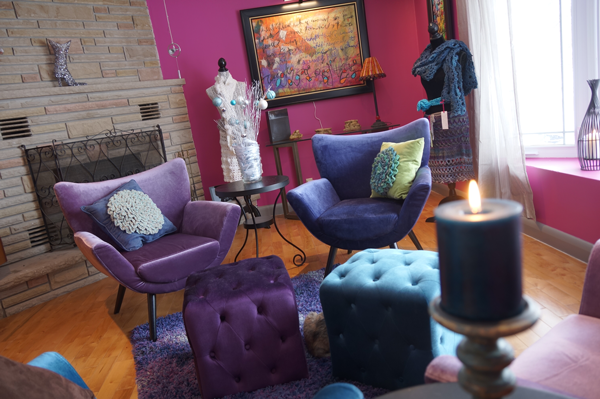 We are loyal to this store as they are non-judgmental and open to new colour ideas. Their exceptionally friendly staff takes your ideas and helps you with further ideas. Diva Dan is responsible for the over all look and colour designed. Our goal was to get outside the box on a typical household setting of neutral colours. Knowing we had stylish furniture and artwork, we decided to try a bold approach. Typically, neither of us would ever think to be this bold. We decided to really reach and see where our creativity goes. The furniture you see is from HomeSense in Ontario Canada. They have really great home decor, kitchenware, linens and much more. We typically visit two locations in Kitchener / Waterloo Ontario. The one in Waterloo is far superior as the one in Kitchener is combined with Winners. They are both owned by the same company; therefore, they are together. The mannequins are also from HomeSense. Accessories such as the glass raised table in the background and candles, they are from Pier 1. We find Pier 1 to be pricey. Though we visit frequently, we rarely buy anything. If we do splurge, we wait for a sale. The silver curtains were found at a store in the summer time. The store was going out of business and moving inventory at 70% off. Daniel and I decided not to have a couch. We find couches to be big and bulky reducing room layout options. We are one to change a room layout frequently. Single chairs gives us unlimited options for how a room can be set up. We don’t have a TV in any living ‘public’ spaces of our home. Only 1 in our bedroom. This means a TV isn’t the focal point where everything must align to. Typically, Daniel and I have taken years to accumulate our furniture and accessories. We wait for sales to ensure we don’t break the bank to pay full retail price if we can avoid it. This renovation cost us about $170 CDN to do. With paint and painting supplies. We did minor repairs to the walls with putty to fix up surfaces with nails and etc. Considering how differently it looks, it was pretty inexpensive. This house has been in Daniel’s family since the very beginning. It’s Daniel’s house through an inheritance. The entire house was in disrepair when Daniel acquired the house about 10 years ago. The entire house had to be gutted and redone. It’s why we are in constant renovations as we do each section when the money allows. Daniel loves light transference between rooms and has put square cutouts in the wall. It’s artistic and practical at the same time. Certain parts of the front of the house have Angel Stone. This same stone is used within the Fireplace. The fireplace has been plugged with insulation as we don’t use it. Though this type of stone was frequently used when the house was built in the 70’s. This stone is harder to find today and is extremely expensive. Painting over this stone isn’t an option as it would be a tragedy to do so. If the bricks were standard, we would have considered it. 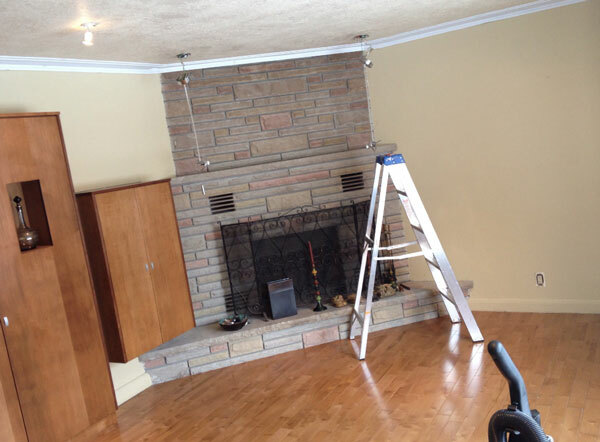 The design of this room had to work with the fireplace being untouched. 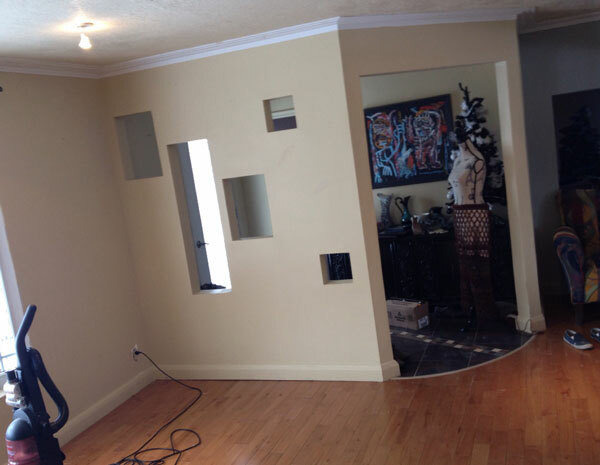 As you can see, this room is been transformed from neutral safe colours to be a bold and stylish room. This styling won’t suit the average person but that’s okay. Our home is our work environment where creativity is free flowing. We work with very colourful and exciting yarns, it’s hard to not want to decorate with the same ideas of the yarn. Both Daniel and I were nervous when we had completed one wall with the crushed berries. We were terrified of it. Once the paint dried and the colour ‘dried down’ to the colour on the chip, we were more settled. It wasn’t until everything in the room was put back before we were fully convinced. Now that one room is completed, we are now transforming our dining room, kitchen, foyer and library on the main floor to match the boldness. We also invested some money for the dallas gutter repair just so that we don’t have to deal with water damage come spring. The main floor will match and when I say matching, I’m not saying we are using the same colours. We are going with bold and bright colours for each area. Stay tuned as I show you more transformation photos. 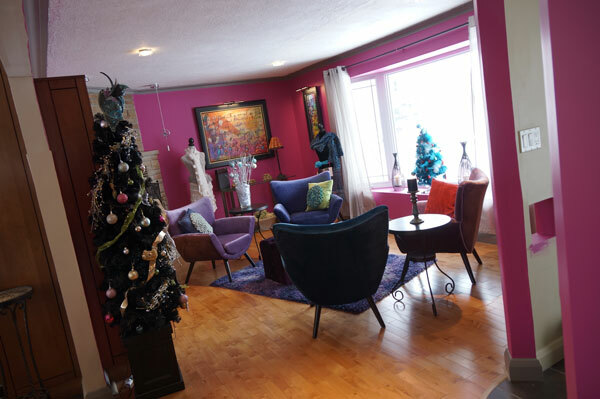 This entry was posted in Advice & Tips and tagged Benjamin Moore & Co., Benjamin Moore Paints, crochet crowd, Daniel Zondervan, Furniture, Home, HomeSense, Interior design, Michael Sellick, Mikey, Ontario, Paint, Studio, Walkerton, Waterloo Ontario. Bookmark the permalink. Where did you get the artwork on the wall by the fireplace? It’s gorgeous! 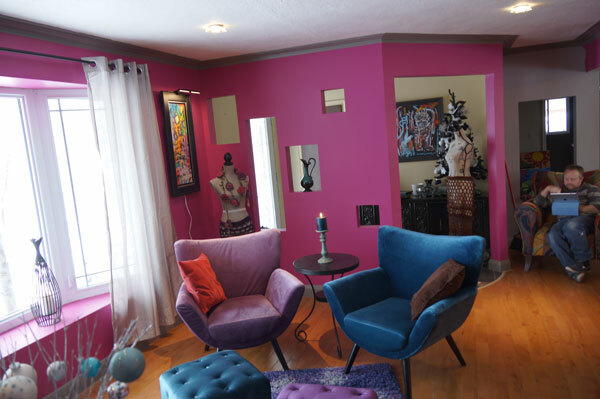 I like most the trendy living room and color. I must say when I first saw the new room I was very surprised. But as I looked at it again and again my mind made me feel like Mikey and Dan were inviting us into there home for a sit down relaxed conversation. Then the thought came to me that this would be a great spot for a weekly sit down show. Not a class but a time we the Crochet Crowed would here from Mikey and Dan in a personal chat or they may have a guest all would enjoy. Just thoughts but always the love they give to us. I was thinking along those lines but to get Daniel to sit down is difficult. We did a live chat in 2011 and it was a lot of fun. I will run the idea by Daniel again. I love the idea of single chairs in the living room, instead of the three-piece suite or somesuch! Lovely colors. I have to say, you both are an absolute delight to me! You make me smile, when I do not feel like smiling. Your home, definitely matches your personalities! I love the in depth detail of the explanation on your remodeling. I’m just in awe of the colours! AWESOME! Waiting w/excitement to see the next room. You and Dan have done a wonderful job. I love your color choices. I would love to use bold and bright colors but my husband isn’t fond. Keep up the good work. I really enjoy your YouTube tutorialso too, , you’ve been quite an inspiration for me. Love the vibrant color! We painted the walls in our home colors we love, and it makes us happier than living with boring neutrals. Our dining room is “crime scene red”, but it’s an open floor plan, so there’s not too much of it, and it is a very rich color. Lots of bright, sunshiney yellow, too…I’m not planning on moving any time soon, so the colors should be to MY taste, not based on resale value. 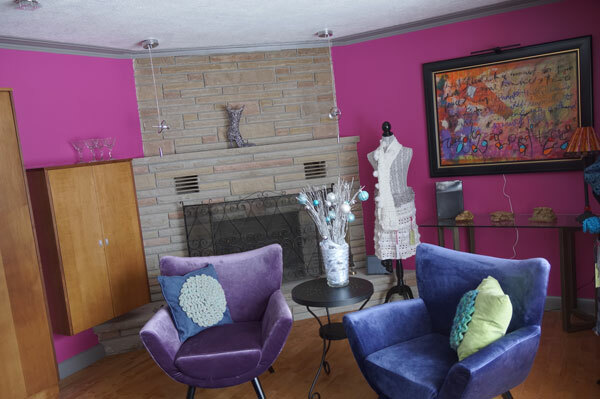 I think it looks great….love the boldness of the color and I’m looking forward to the rest of the rooms as you share them with us. We’re in the midst of some remodeling and painted our dining room purple…..like you, I was a little concerned when my husband put the first swipe of paint on it but after it dried and was a deeper intensity, I love it! I love it! I wasn’t sure when I seen the first pic of the room before you added back in the furniture, but OMG, you have made this graphic designer’s jaw drop! So bold! In reading your blog, your FB posts, and watching your videos I would say you two have expressed yourselves! Would be wonderful to sit with a hot cup of tea looking out on the world in such a beautiful room. Amazing! What a difference a little color can make. Once my twins get out of the destructive ages, I plan to redo my own living room. While I doubt hubby will go for anything this bold (and I have gorgeous woodwork I refuse to paint), I am hoping for a nice splash of color. Good job, guys! Love it, Love it. The colors are wonderful and the furniture is fab! Can Dan come to my house the day after Christmas and advise me-10am is fine. Love you guys. Have a Happy Christmas. I absolutely LOVE those little peekaboos between your livingroom and foyer! I’m totally going to steal that concept when we a a front door. And I’m certain Dan has a fab idea for color in the foyer as well? I wanted to say love the colors. It looks amazing,love the loves. I’m looking to paint a bedroom after the holidays. It’s small,one window. Have any ideas,in what colors would make it look bigger? Love to hear, your ideas. Have a great holiday. A very nice room and space to start with transformed into “WOW”! Love how the new color makes your art work and furniture just “pop”! Mikey you and Dan could go professional in interior design! I sure wish I had an eye for color like that – please tell Dan nice job! Like the comment above, I am Impressed! Can’t wait to see the other rooms! Thanks for sharing. Marvelous darlings, simply marvelous! Can’t wait to see more. (As a side note: I am a remodeling contractor here in San Antonio, TX and I use B.M. Aura paint almost exclusively. Rarely when a client doesn’t want to spend the extra bucks and I use an alternative paint the results are never to the quality and always takes more paint and my time. Great job guys keep it up! Love love love the color combinations! I say make your house YOURS and don’t worry about what other people say. You guys are the ones that live there and your home should be your castle. Love it. One step at a time you will get it all done. Good Job. I think that your living room is Sumptuous! If I can ask, where do you live? He’s got a Fantastic eye for colors and for how best to use the space! I’m nobody, but please tell him that I’m Very Impressed! We live in Ontario Canada… He appreciates hearing kudos… I will let him know. I absolutely LOVE it! Amazing job. A very bold statement. I can’t wait to see more! What is the flooring? It looks great with your changes. It looks awesome guys! I am excited to see what you do with the rest of the house. 2013 had found me coming out of my neutral shell and using bold, fun and stimulating colours! I’d love to have you both down for dinner some time in the new year!